Today is the 40th anniversary of the release of Star Wars, now known as Star Wars: Episode IV A New Hope. It’s about as iconic as a film can get and subsequently spawned the gargantuan media franchise that we all know and love today. Yet, beyond all the famous “Use the Force,” Death Star battles, and Mos Eisley Cantina stuff, there’s one tiny goof that fans have come to adore. 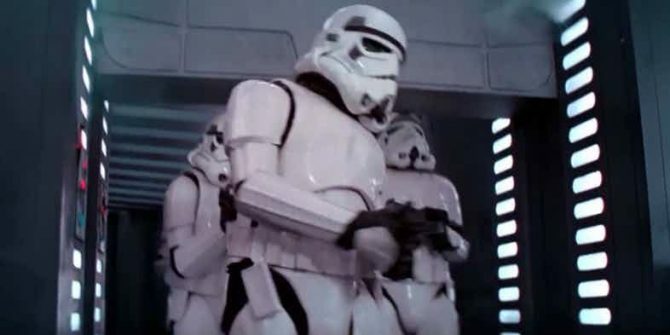 I’m talking, of course, about the famous Stormtrooper who bumps his head on a blast shield door. Until now, it’s been a little hazy who exactly was in the costume, but THR have finally figured it out: it’s actor Laurie Goode. Interestingly, Goode only got the role as the original man cast, Peter Dukes, called in sick at the last minute. And so the legend of the clumsy Stormtrooper was born. In an amusing twist, George Lucas actually enjoyed this blooper so much that he ended up referencing it in Attack of the Clones. In that film, Jango Fett climbs into his ship and manages to strike his helmet on the door, causing an audible metallic bonking sound. Fett was the biological model for the clone troopers, many of whom went on to become Imperial Stormtroopers. And so their genetic predilection for clumsily whacking their heads into stuff became an established, if minor, part of Star Wars canon. We salute you Mr .Goode for your contribution to Star Wars. We also thank you for managing to keep control of your guts on that fateful day.